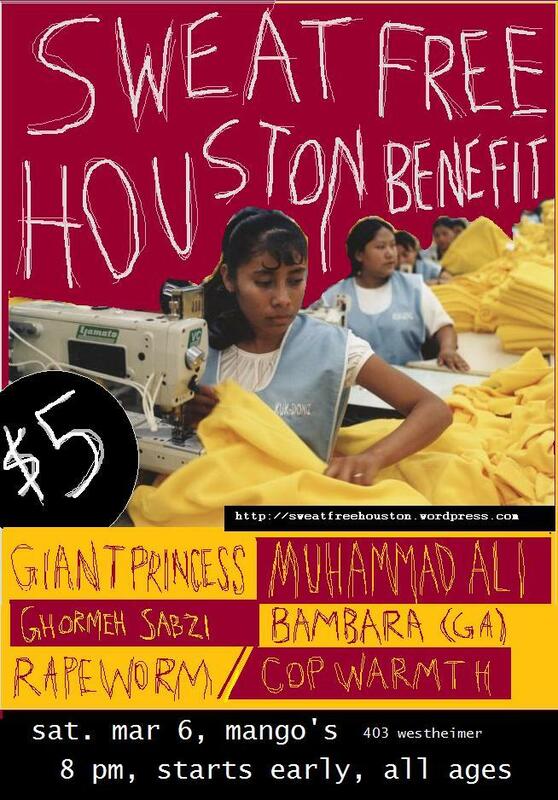 This Saturday, March 6, 2010 from 8pm to 2am at Mangos, at 403 Westheimer, there are six, count them six awesome bands playing to raise money for Sweat Free Houston . The show is open to ALL AGES! Sweat Free Houston is working to get a sweat free procurement policy passed by the city. For more information check their “about” page on their website. This entry was posted in benefit show, sweat free houston and tagged Bambara, Benefit concert, benefit show, Cop Warmth, Ghormeh Sabszi, Giant Princess, Muhammad Ali, Rapeworm, sweat free houston, sweat free ordinance, sweat free procurement policy. Bookmark the permalink.